A delicious food base beverage in dried powder form. It is made from an Okinawa all natural food formula derived from fermented Japanese soy, rice and sweet potato presented in ready to mix powder. Consuming Somaplus will help a person experience noticeable improvement in Strength, Skin Health and Wellness. This pleasant experience will continue to improve month by month and will reach optimum level 6 months. It is important to note that improvements experienced may differ from person to person. This is probably due to our body’s ability to absorb the nutrients. 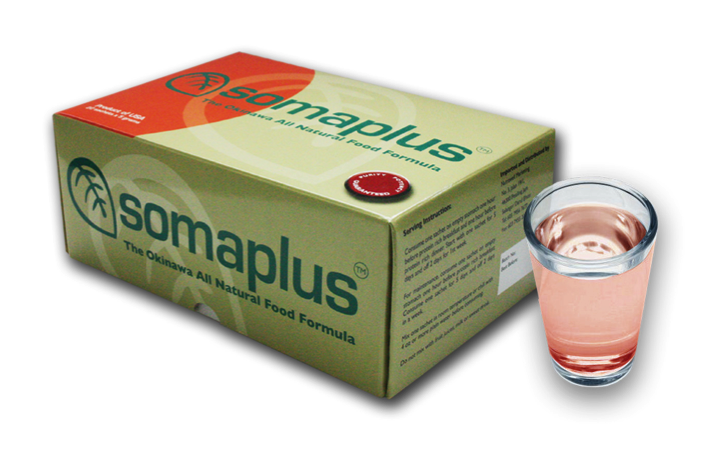 Somaplus is an all natural approach to healthy ageing. Consult your Healthcare Consultant today and start benefiting from it. For maintenance, consume one sachet on empty stomach one hour before protein rich breakfast for 5 days on and 2 days off for every week. Mix one sachet in room temperature with 4 oz or more plain water before consuming. Patients with known history of being allergic to soy proteins, rice and sweet potato are advised to refrain from consuming Somaplus.